Why Does God Allow Diseases to Occur? Have you ever been sick? Not much fun, is it? Why do we get sick? Well, it may be because we have a disease that affects our bodies (and sometimes our minds). Diseases come in many forms. Some are as mild as an earache, while others are as deadly as cancer. Diseases have killed more people than all the wars ever fought. In 1918-1919, influenza killed 20 million people around the world! And diseases affect the lives of millions more because they often leave people scarred, paralyzed, etc. Not all diseases are alike. Some—caused by bacteria, viruses, and other "germs"—are known as "infectious" diseases. When diseases spread from one person to another, they are known as "contagious." 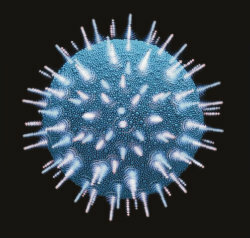 A good example is influenza ("the flu"), which is caused by viruses that move easily between people. Other diseases—known as "non-infectious" diseases—have many causes, but are not caused by germs. Diseases like strokes, heart attacks, and diabetes (that are not contagious) may be caused by substances that harm the body (like cigarette smoke). Or, they may be caused by an incorrect diet, stress, or aging of our bodies. Interestingly, some diseases generally occur only in certain parts of the world. African sleeping sickness is found mainly in hot, humid sections of Africa where it is spread by the tsetse fly. And some diseases occur chiefly at certain times of the year (like the flu, which affects people mostly during winter months when they are cooped up together inside due to cold weather). And some diseases can be spread to humans by animals. Malaria (found throughout much of Africa) is spread by a mosquito. Fleas spread a deadly disease known as "bubonic plague," and ticks can infect people with Lyme Disease. Or, people can contract a disease by handling clothing, bedding, or other nonliving things that have come in contact with sick individuals. Diseases even can be spread through the food we eat or the water we drink. The Bible mentions numerous diseases. God sent boils upon the Egyptians (Exodus 9:9-10). The apostle Peter’s mother suffered from a fever (Matthew 8:14). Jesus healed a man with leprosy (Mark 1:40-42). In fact, the Bible says that "Jesus’ fame went throughout all Syria; and they brought to Him all sick people who were afflicted with various diseases and torments, and…epileptics, and paralytics; and He healed them" (Matthew 4:24). We are fortunate to have good doctors and powerful medicines. Even more important, we know that no matter how sick we become, one day, if we obey Him, God will take us home to heaven where there are no diseases. There, everything will be perfect—"death shall be no more; neither shall there be mourning, nor crying, nor pain, any more" (Revelation 21:4). Kind of makes you homesick for heaven, doesn’t it?